I created this card for a special friend. I used a Stitching Stencil by Ann's Paper Art, AND002. Threads are Mettler Polysheen 0520, 0945, 1123, 1220, 1332, 6133. I used quite a mixture of dies on the card. Marianne Design, LR0395 wave boarder, CR1354 butterflies. 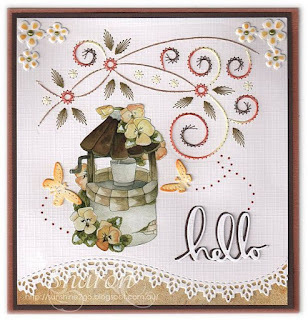 Leanecreatif Flower Frame and Poppystamp die Hip Hello. 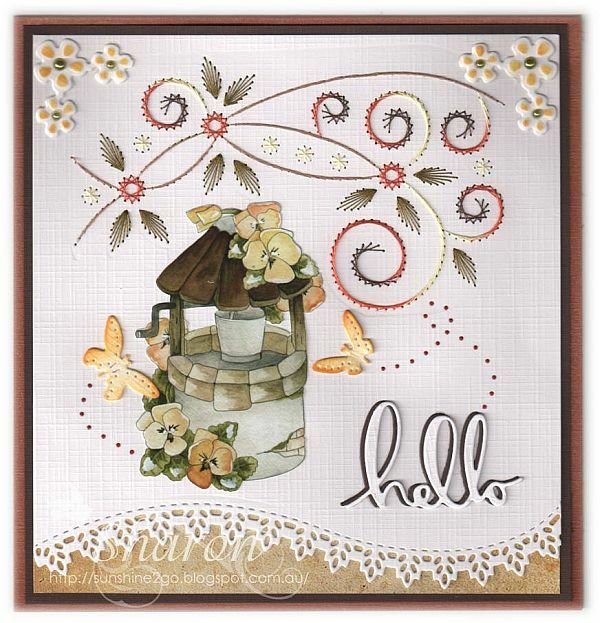 Decoupage is from the Springtime Collection by Precious Marieke, CD10619. Patterned paper by Doodey papers. I have been busy creating it is all work in progress. coming by and visiting My Craft Cupboard.